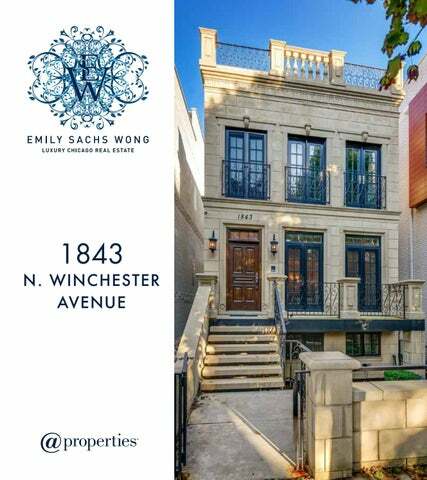 184 3 N ORT H WI N C H ES TER AVENUE This transitional home is right where you want to be, situated in the heart of Bucktown, just steps to the cityâ&#x20AC;&#x2122;s best shopping and dining! The thoughtful floorplan offers sun-filled spaces with newly refinished hardwood flooring. The living room and open dining space features a sophisticated fireplace with a custom stone surround and French doors overlooking tree-lined Winchester. The eat-in kitchen offers ample cabinetry, granite countertops and high-end appliances, as well as an oversized peninsula, which makes for a great breakfast bar. The spacious family room is open to the kitchen, and has direct access to the back deck, paver backyard and garage rooftop deck. This is the perfect space to relax or entertain! The expansive master suite features a walk-in closet and a spa-quality bath with heated flooring, dual vanities, a separate soaking tub and a steam shower. Sunlight fills the space through a full wall of French doors. Two additional bedrooms, a hall bathroom and laundry can also be found on the master level. The finished lower level includes a spacious family room with a fireplace, a wine cellar and access to a great walk-out patio. Two guest bedrooms and a full bathroom complete this level. This home has great outdoor space as is, plus the opportunity to add more with an internal staircase leading to the rooftop with fabulous city views. Just a short walk to everything Bucktown has to offer, including the 606 trail. Burr Elementary School District, too. This location canâ&#x20AC;&#x2122;t be beat! WINE CELLAR 3'3" × 6'5"
BUCKTOWN As the story goes, Bucktown was named after the goats that roamed there once upon a time. Another one of Chicago’s fabled goat tales? We can’t say for sure. What we do know is this: The once-working class neighborhood has had an incredible evolution. As an artists’ community, nightlife hotspot, foodie destination and shopping mecca, Bucktown is undisputedly one of Chicago’s trendiest neighborhoods. Bucktown’s restaurant scene is diverse, local friendly and foodie worthy. Residents also enjoy a uniquely quirky mix of independent bookstores, shops, bars, galleries and theaters. Meanwhile, upscale retailers have made the neighborhood a designer destination. Damen Avenue has emerged as a must-shop destination for visitors and residents alike. The dividing lines between Bucktown and Wicker Park are often blurred, as the two neighborhoods share a lot in common: they both have an appreciation for historic buildings and modern living. Overlooking the six corners intersection at the center of the neighborhoods, a stunning Art Deco skyscraper is now a modern boutique hotel with a rooftop bar and amazing views. A stately historic bank building on the corner is now home to a drug store with stunning archways and stained-glass ceilings that embody happy and healthy. Located a few miles northwest of the Loop, the neighborhood has a variety of housing – from stately brownstones and two-flats with yards to converted loft apartments, modern new construction and condominiums. Getting around couldn’t be easier – from walking, running and biking the new 606 Trail to riding the CTA Blue Line, numerous city buses. Drivers appreciate they can hop on the Kennedy Expressway just east of the community for easy access the city and suburbs.